The 21th episode of THE FIRE AND WATER PODCAST is now available for your listening pleasure! THE FIRE AND WATER PODCAST is the official podcast of FIRESTORM FAN and THE AQUAMAN SHRINE. 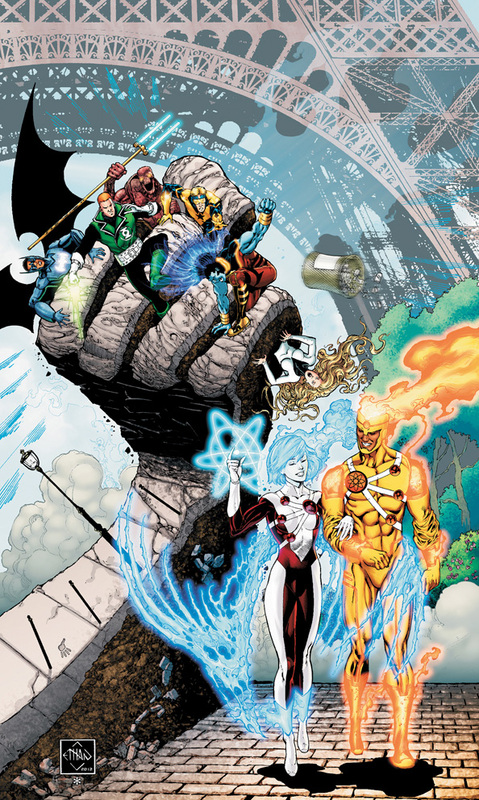 This episode Shag and Rob talk about Aquaman #9 (by Geoff Johns, Ivan Reis, Joe Prado, Oclair Albert, Andy Lanning, and Rod Reis) and The Fury of Firestorm: The Nuclear Men #9 (by Ethan Van Sciver, Joe Harris, Yildiray Cinar, Marlo Alquiza, Norm Rapmund, and Hi-Fi)! We’re building towards an inevitable confrontation between Aquaman and Black Manta, then the JLI stops by for a visit with our favorite Nuclear Men! The podcast wraps up with your listener feedback! You can find the 21th episode of THE FIRE AND WATER PODCAST on iTunes. While you’re there, please drop us a review on the iTunes page. Every comment helps! Alternatively, you may download the podcast by right-clicking here, choosing “Save Target/Link As”, and selecting a location on your computer to save the file (31 MB). Check out the gorgeous virgin covers (meaning without the logos) to the The Fury of Firestorm and Aquaman issues covered on this podcast! Posted in: Comic books, Ethan Van Sciver, Firehawk - The New 52, Firestorm #09: New 52 v1 (Firestorm Protocols), Firestorm comic vol. IV, Geoff Johns, Jason Rusch, Joe Harris, Justice League of America, Mikhail Arkadin/Pozhar, Norm Rapmund, Podcast, Ronnie Raymond, Yildiray Cinar. 1. I think I enjoy taking digs at Shag because he’s such a nerd bully over Rob. Boy, did Shag ever drop the ball on that “unofficial podcast” thing. An audio fart to clear the room right from the get-go. 2. Yeah, Andy Lanning inks, and he’s pretty good too. If I recall correctly, he used to embellish guys like Liam Sharp and Phil Jimenez. It’s a weird dual discipline, though. Ever notice inkers/colorists turned writers almost always have a co-pilot? 3. I’d be perfectly happy with Prisoner of War being the new Ragman if the old Ragman could come back as the skid row super-hero, instead of a poorly tailored Ghost Rider. 4. Ouch, that was a bad audio reference on Teen Titans. 5. Let me just say that I’d have liked to have seen more of Mercy Reef, and against all odds Arrow actually looks like a pretty cool show by CW “standards.” Just as Hawkeye finally sees his chance to become “The” archer in Marvel’s The Avengers, Ollie reminds us that he can bring the Batman in a serious way. Also: Hawkeye was upstaged by Black Widow, and neither would have been missed from the movie. 6. Voodoo, Resurrection Man, and Captain Atom are over, with Grifter and Blue Beetle serving as Firestorm’s buddies in the dead pool. I’d seriously suggest a big “jump on with #0″ fan drive right about now. 7. I’m going to have to side with Rob on Google+, mainly because I hate social networking in general. Actually, come to think of it, society as a whole. 8. I’d like to think Firestorm has life left in them, even if it involves joining a team, so the Podcast format is safe(ish.) It’s not like Aquaman isn’t carrying the show anyway. At the moment, 15,000 copies seems to be the kill line amongst the New 52. The canned Voodoo and Captain Atom fell below it. Resurrection Man was well above it, so I suspect the creators chose to end it at a satisfying point, rather than let it carry on somewhat south of middling. The first Rob Liefeld issue of Hawkman only sold a few hundred copies more than Firestorm, and Grifter is way down the list, so I expect the Nuclear Men will overcome them by default in time. I don’t think DC wants a Firestorm book as much as they do a Blue Beetle one, but I also don’t see them having an itchy trigger finger for either. Frankenstein likely has been buoyed by the recently departed Jeff Lemire. My thinking is that Firestorm should survive the next Wave culling or two, but probably won’t get past any others unless there’s a significant improvement in sales. That said, he could have as much as another year left, even without a bump. Haven’t finished the episode yet so I don’t want to comment on it, but I want to respond to Frank’s numbers above. I think you make a good point regarding what DC “wants” versus what it can sell. I don’t see DCU Presents, for instance, going anywhere any time soon because I think that DiDio really wants a superhero “try out” title where they can either stick small projects they can’t sell as a mini (Challengers of the Unknown, Savage) or use it for set-up material which doesn’t fit elsewhere (upcoming #0). Functionally that is a useful title. I agree that DC probably “wants” a Blue Beetle title with a Hispanic lead, and that Frankenstein is not going away any time soon (even with Lemire leaving the incoming writer is a Lemire acolyte, from my understanding). I disagree with you about Hawkman and Firestorm, though. The buzz over the new Hawkman creative team has been really loud, much more noise than we heard for the original crew. Joe Bennett’s art is winning a lot of people, and Liefeld’s fanbase (I know, I was as shocked as anyone…) is very active about promoting his books. The fact that Rob is [i]not[/i] drawing the title is a plus as well as is bringing back Shayera. I think that of the two, Hawkman will continue to rank slightly higher than Firestorm and both will survive into their second years (#25). Beyond that, Results Hazy, Try Again Later. Ultimately it’s clear who the big winners are in the New 52, and its clear who the dogs are. The middle of the pack books (sales wise, I am not talking about quality here) are all sort of just jockeying for position and it’s creating some interesting intra-company competition to put out the best books. I think this sort of environment is very stressful for creators but at the same time produces better product all around because everyone is bringing their A-game. I have no doubt that Liefeld and Bennett, and Harris and Cynar, and every other writer/peciller team for these “middle of the pack” books are pushing as hard as they can to make the best book they can, so the gig can keep on rolling. The ironic thing about all this? For all the fanboys and comics “journalists” (a-hem!) rant and rave about how they want something “new” and “different” from the New 52, they all just buy a dozen Batman titles and ignore the offbeat books. Oy! My apologizes to Yildiray Cinar, I totally butchered his name in that last post. I know how that goes! Hey Shaggggggg, regarding Lorraine/Therese— I’m totally with you on liking the new Firehawk. All I’m saying is that I’d like to learn more about Therese so that she’s as much of a fleshed-out character as Lorraine was. Hey Robbbbbbbbbbbbbbbbbbbbbbb, can you explain exactly what an embellisher does for the uninitiated? Thanks. For the record, the one DC title I expect to keep up with for the foreseeable future is National Comics. I passed on DC Comics Presents because of its serialization, which ends up stretching a single issue’s plot into a stealth mini-series. National is more offbeat in its character selections, the format forces writers to tell a complete story with some density, and it’s exactly the sort of imaginative lark that offers potential innovation within an otherwise cynical line wide reboot. Wow, Mr. Freeze AND Captain Cold wear sleeveless vests? How exciting! Honestly Shagg, they wrote Kenny Braverman/Conduit out of continuity… It’s safe to come back to Superman… Except for that Grunt Morrison fellow hanging around… Not sure about him! On a Firestorm related topic, I am looking forward to future stories based on Ronnie and Jason just being teenagers… Who happen to be Superheroes… Or weapons of mass destruction. If they adopt some of the magic of the old Gerry Conway stories, mix that in with todays media and social network obsessed teen traits, then I believe you have a book that should last well into the next few years. Also let me add, that yes Shagg, Young Justice is one AWESOME show. By far one of the shows around, and not just in animation! They have introduced alot of characters with some interesting twists to their origins or personalities. And I keep hoping that either Ronnie, Jason and/or Prof. Stein show… Even for just a cameo! 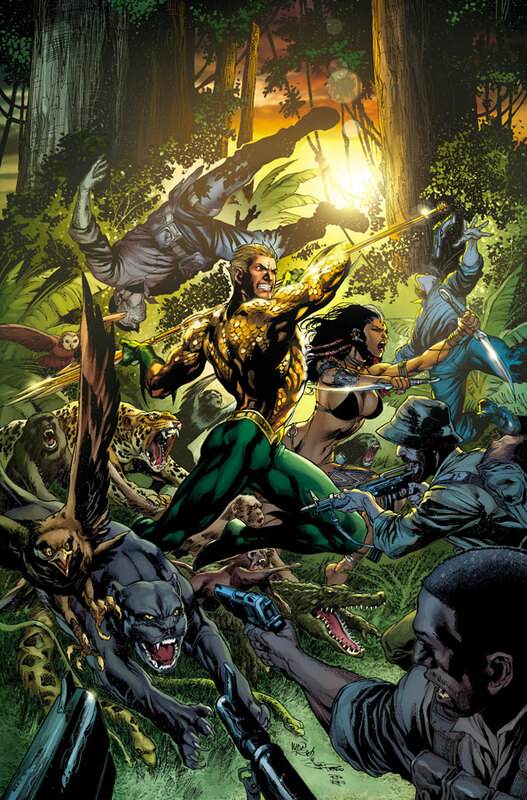 For Aquaman #9, I really liked the Twist Ending and the lead in to the big showdown next issue. Black Manta and Aquaman throwing down shouldn’t happen super frequently, because I like how when they face off now, there is a ton of excitement and gravitas about it. We saw this when they faced off in Brightest Day — it was an “event” inside of the event — and we are seeing it now. The animosity between these two characters has rapidly become one of their defining traits and I really enjoy seeing it. Rob, I had to grin at your name-drop of Suspiria. I am a huge fan of Dario Argento’s work and Suspiria is one of his best. To me, his masterpiece will always be Profondo Rosso — “Deep Red” — but Suspiria is one of the best horror films ever, and in the running for the best supernatural horror movie of all time. On one of my podcasts, the Vault Of Startling Monster Horror Tales of Terror, we are going to be doing a series on Argento along with some other Italian Horror masters in the next few months; I will be sure to hit you with a link. I too love the Saturday Morning Cartoon ad! I esepcially like the inclusion of Inch High Private Eye! I have not picked up Fury of Firestorm #9 yet, but for the promise of Yildiray Cinar drawing OMAC I may have to do just that. The JLI doesn’t hold much interest for me as a team beyond OMAC, but I like OMAC enough to warrant the purchase, especially when he is rendered by an artist as talented as Cinar. I did think that the names of the merged Firestorms — Fury and Wrath — were cool. They reminded me of WCW in the late 1990s. In fact they did have a wrestler named Wrath (Bryan Clark), who, oddly enough, had earlier worked under the name Adam Bomb in WWF. So it all comes full circle on that front! Great to hear all the listener feedback! I envy you guys amount of feedback because as every podcaster knows, getting comments back makes all of the excruciatingly hard work worthwhile! Keep up the good work, dudes! Wow! You guys totally rock! I can’t get over all the amazing comments! Thank you! We really appreciate all the feedback. @Frank – Thank you for the thoughtful analysis on sales figures. You make a lot of valid points (never thought you’d hear me say that, huh?). I hope Firestorm is able to survive long enough to grow the fan base. In regard to Ragman, I finally read the original Ragman series from the 70s. Ummm… sorry, not much of a fan. Conceptually he was great. The actual comics, not so much. I’m more of a 1990s/2000s Ragman kinda guy. Those podcast fan names are just plain gross, you sicko. National Comics is a great idea; they just need to solicit an issue that looks interesting. And yes, I’m totally a Nerd Bully. @Luke – I’m thrilled Hawkman is generating so much buzz (color me jealous). As you mentioned Rob Liefeld certainly has his legion of fans. He’s a super-nice guy, just his art and writing aren’t for me. Sorry. Great points about the middle-of-the-pack comics, and that people are just buying more Batman! Yes, the Aquaman twist ending was cool. However, that was Shin’s version. The truth might be very different. “Fall In, a Prisoner of War Podcast!” Awesome! @Martin Stein RIP – Sounds like we’re on the same page with the new Firehawk. While super-cuteness will go far, we’ll eventually need to learn about her back story. Booster and Skeets? Maybe! In regard to Blue Devil, I’ve always seen the quality-split being between issue #9 and #10. Either way, I don’t think Kid Devil was out of line with anything else in the series. The first six issues are pure gold. They should really be collected. @Keith – You’ve found my Kryptonite… Conduit! I also would love to see Ronnie and Jason being typical teenagers struggling with secret identities. Conway knew his stuff! Finally caught a couple episodes of Young Justice.. .good stuff! Thanks again guys! We’ll be sure to mention each of you on the next regular episode of the FIRE AND WATER PODCAST!